Businesses in the Philippines look set to benefit from the newly stabilized political environment. President Gloria Macapagal Arroyo of the Philippines had reason to exhale a sigh of relief on September 6. The Congress had thrown out attempts by the opposition to impeach her over a phone call she made to an electoral commission official just after the election that put her into power. Business also had reason to sigh with relief: With the political problems out of the way, a government that has already produced advantages for investors can get back to work on reform. What’s more, a Supreme Court decision to uphold the legality of an extended value-added tax program is a step forward for the government’s ambitious debt reduction program. Commentators see political leadership as an essential factor in the direction of the Philippines’ economy. Fidel Ramos turned “the sick man of Asia” around and set the nation heading forward. Then Joseph Estrada undid much of the hard work and put the patient back into the intensive care ward. Now, with Gloria Arroyo, beset though she is with political attacks, the economy is again responding to her injections of reform. Positive change has come on the regulatory side, adds Romualdez. “A lot of work has been done to streamline the bureaucratic process and to tackle issues that are multi-stakeholder sensitive,” he says. Government has established a forum that allows input from every stakeholder group and most recently created a Minerals Council that works as a sub-cabinet cluster that shortcuts earlier delays as investors went from department to department. “A public education process has also been started by Arroyo to inform stakeholders of the issues,” says Romualdez. He cites the appointment of former foreign minister Delia Albert as the first ever minister for mining investment as another sign that the industry is getting the attention it deserves. The results: $500 million actual investment in a total of 23 projects that could involve total spending of a massive $6.5 billion. Telecommunications, acknowledged by critics as the only infrastructure area where the Philippines is ahead of the game, has exploded. “The growth of mobile telephony is nothing short of phenomenal,” says Pena. “We now account for 35 million subscribers from three operators. The primary driver is SMS, or text messaging, with volumes of 200 million transactions daily.” Ironically, the growth in cellular services has left the nation’s fixed-line infrastructure under-utilized. 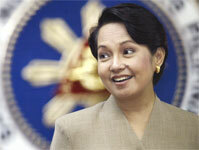 While Arroyo has been good for business, more problems still exist. Central bank governor Amando Tetangco Jr. describes the fundamentals as “generally sound,” but he admits to a record $69 billion in foreign debt—110% of gross domestic product. 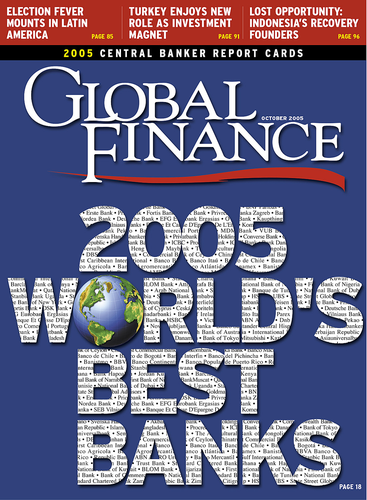 But, he points out, most of that debt is long-term, and ratings agencies have not moved to downgrades. Speaking before Congress’ decision to drop the Arroyo impeachment move, he pointed to reform plans including a bigger tax take for the government. Tetangco says reforms will be geared toward maintaining a healthy banking system and further developing the local capital market. “The reforms include accelerating the move to risk-based supervision, refining corporate good-governance regulations, such as fit and proper standards, and aligning prudential regulations with international standards and best practices,” he says. Analysts say the changes are much needed: The banking system continues to suffer non-performing loan levels of around 10%. With more reforms on the drawing board, growth is already solid. 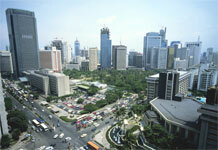 In the second quarter of 2005, the Philippines recorded 4.8% growth, faster than neighbors Malaysia and Thailand. The growth is being driven by services, which put on 6.1% in the second quarter after adding 6.5% in the first semester. Industry was also buoyant, with second-quarter growth of 4.6%, slightly above the first-semester figure of 4.4%. Socio-economic planning secretary Augusto Santos told Congress that he believes annual growth of 5.3% this year is still feasible, despite the shock of high oil prices. He said agriculture was expected to contribute strongly to national growth after recovering from an El Niño effect that slowed production. Investment is strongly up. Budget secretary Romulo Neri said in a mid-year economic briefing that “international investors have acknowledged the country’s progress with preliminary figures pointing to a 173% increase in foreign direct investment in the balance of payments account in the first five months of the year.” Trade secretary Favila said investments in sectors such as mining, information and communication technology and the health sector reflected growing confidence. “Against an external environment of rising oil prices and low global growth, exports continued to show positive performance and the export mix is diversifying, leading to an increasing export share for sectors such as automotives and processed food,” he said. The latest reports of new investment come from Siemens, moving to establish a call center in the Philippines that will create 520 jobs. The company will get a tax holiday and exemption from import duties and taxes on imported machinery and equipment under the country’s liberal investment laws. Hong Kong-based First Pacific Co. has increased its shareholding in Philippine Long Distance Telephone Company. Manuel Pangilinan, chairman of the phone company, says the Hong Kong major now holds 25% of the operator. More investment is planned by First Pacific, he says. This includes a $15 million stake for a 25% share in Level Up, the pioneer and market leader in online gaming in the Philippines, India and Brazil. The interest in the telecommunications and IT sector is no surprise to the Asian Development Bank. In a recent study, it praised the country’s telecommunications infrastructure. But, said the ADB, the Philippines was lagging behind other East Asian developing economies in other areas of infrastructure development. It’s a mix that promises quick efficient phone connections but hours stuck in traffic jams. Anyone who has been anywhere in Asia will probably have noticed one factor that is common to many countries in the region: migrant workers from the Philippines. In Dubai they work as restaurant wait staff, shop assistants and mid-level managers. In Indonesia they are known as good accountants. In Hong Kong the city’s Central district takes on a distinctive flavor on Sundays as domestic workers take their day off and get together in the area’s parks. Alfred Dy, head of research for CLSA in Manila, describes the country’s overseas workers as “the saviors of the economy.” They contribute heavily to the high level of liquidity in the country’s financial system. Official estimates say these migrant workers send back a massive $10 billion a year, but, Dy says, informal transfers contribute another $3 billion to $4 billion. That’s around 15% of GDP. Central bank governor Amando Tetangco Jr. in early September acknowledged the significance of overseas workers’ contribution to the local economy. According to Tetangco, overseas workers, along with portfolio investments, contributed a 13.6% increase in domestic liquidity to July. Domestic liquidity rose to 2.21 trillion pesos ($39.3 billion) in July from 1.938 trillion pesos at the same time last year. “The continued rise in domestic liquidity can be traced mainly to the build-up in banks’ foreign exchange positions due to inflow from remittances by overseas workers and portfolio investments,” Tetangco said. This high level of liquidity is feeding consumer demand, in turn assisted by low lending rates at the nation’s banks.